This gooseneck cup holder mount is to be mounted in to your standard vehicle cup holder, it has a build in size adjustment to fit standard cup holder of most vehicle. The universal 360 degrees rotation claw-on device holder is able to clamp any device from 1" (25mm) to 3.5" (90mm) device. 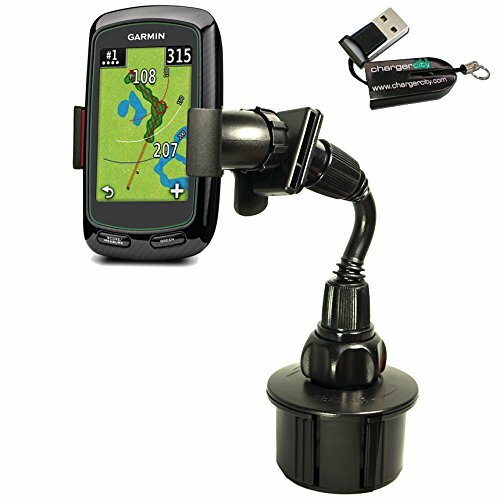 The base cup holder mount has a 17mm ball connection that will also snaps into any Garmin GPS cradle that you already have, forming a ball-and-socket type joint that allows the GPS to be easily angled into the desired viewing angle.